George P Johnson's Launch of London’s First ICC at Excel London event is one of six submissions for Visit London's Business Event of the Year award. Overview: On 1st May 2010, ExCeL London opened its phase 2 expansion. The event heralded London’s first International Convention Centre opening but also marked a whole new chapter in London’s business offering. The event had to deliver on a number of important objectives – it had to captivate and engage press, dignitaries and VIP’s but also had to inspire members of the events and conference industry to use the new facilities for future events. Execution: The event experience was designed around a number of key components including creating the first ‘London Future Forum’ – which was a live industry debate which took place first thing in the morning. 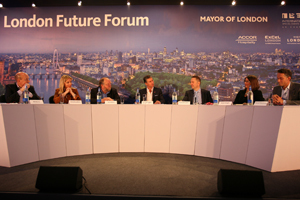 The forum event, which was also streamed on-line, was all about London’s future as a business and events destination. Running alongside the morning forum event were networking drinks, private site tours and a media briefing and press conference with Mayor of London. The busy morning event schedule culminated with all guests attending keynote presentations by Mayor of London Boris Johnson, Kevin Murphy CEO of ExCeL London and His Highness Sheikh Sultan from Abu Dhabi. With engaging speeches from all three men a dramatic kabuki drop finale revealed the new auditorium. The reveal was followed by celebratory drinks and canapés and a four course lunch using London landmarks as table centres and a ‘Best of British’ themed menu.